It’s time to take a look at the new King Kong film. 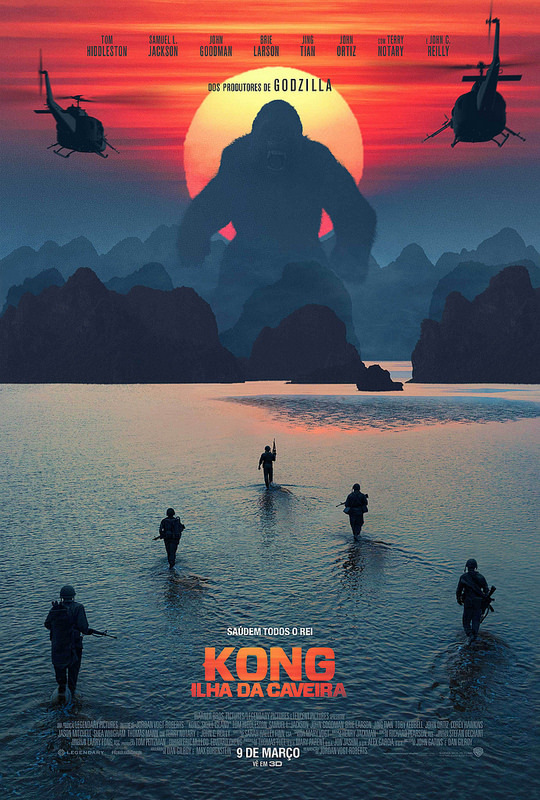 I’m not a King Kong fan nor will I ever be at this rate, but this film got a lot of hype since it’s in the same continuity as Godzilla. Maybe the latter’s quality would rub off on King Kong and elevate the series to new heights. Unfortunately, that didn’t happen. It’s still the same old King Kong with a fresh layer of paint. It makes the same mistakes although at least it doesn’t force any random romance plots into the film. Still, you can’t help but wish that the film had chosen a very different path. The film is about two scientists convincing the government that they should head to Kaiju island to see what’s there. They are escorted by Preston and his team of commandos along with James, a skilled mercenary. They decide to bomb the island to scare everyone into submission, but this wakes up the mighty King Kong. The majority of the “heroes” are destroyed in the initial confrontation and the survivors have to find a way off the island. That’ll be tough since there are many monsters aside from King Kong. Preston also wants revenge on the big gorilla and he has some guns at the ready. Can he win this round? One thing about King Kong is that a lot of people don’t find him to be all that scary. Why would they when falling off of a building is enough to destroy him? This version is a little bigger than most of the old film versions so that helps his case a little, but he is still injured by bullets here. A well placed fire blast does a lot of damage as well so I’m going to feel bad for him if he ever has to fight Godzilla. If ordinary fire can do that, imagine what ATOMIC breath will do to him. The poor guy would be incinerated in an instant. The only sad part is that King Kong is the heavy under dog in the fight so I wouldn’t be surprised if he wins as a result. Anyone remember Batman V Superman? The Godzilla angle is the main reason why you guys are watching this film so you should start to consider this angle. I am hyped for the big crossover even if it isn’t happening for quite a while. It’ll certainly be worth the wait. There is an after credits scene in this film so stick around. Now, why am I disliking this film so much? There are a few reasons, but lets start with the obvious one. The animal violence is a problem here. We get a whole scene where we see Preston blow up a bird’s head. He’s the villain here so it’s to show us how mean he is, but it’s not helping the film’s case at all. There is a very thin line between monsters and animals and this film opted to have them be closer to animals than monsters. Bad move because the violence is a lot worse this way. It’s also sad when you consider that the humans are picking this fight. The monsters were just fine on their own until their island started to get blown up. They were simply defending themselves even if the film tries to get you to root for the humans. Not me, I was on the creatures side from day 1. It doesn’t help that all of the humans are just annoying the whole time. They weren’t all bad though, just not likable enough to be excused. Preston was certainly not likable at all. The film gave him a ton of hype though so that was amusing. He is so out classed here so I couldn’t take that angle seriously. James is another hype character, but he never gets to do all that much. He has his big scene at the beginning, but he seems to panic just as much as the others and didn’t seem as tough and gritty as you’d expect. His “confrontation” with Mason on the bottom of the ship wasn’t as hype as the film thought it would be. They both talk tough and call each other’s bluff, but neither one actually gets anywhere. They were essentially fueling each other’s ego. James essentially never got any real character and the scene where he grabs a sword was just incredibly random. It also wasn’t a good scene since he was slashing a bunch of bats. Mason wasn’t a bad character either, but she really had no character either. At least she tried to help one of the monsters which was nice. She beats her counterpart from the earlier films. The rest of the cast were basically comic relief and didn’t do anything. A common trend here is that most of the characters weren’t bad, they just weren’t that interesting or likable either. 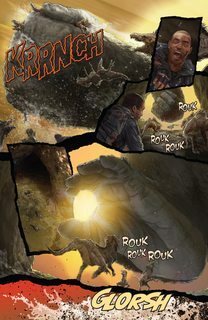 King Kong’s fight against the Skullcrawler was pretty good. The mini ones were pretty outmatched so they went down quickly, but I’ll definitely take that over the usual T Rex fight. These guys certainly had a better design after all and then the big one made for a nice villain as well. I was actually expecting a plot twist about these guys being the original Godzillas and the final one would return after the credits in his new Godzilla form. Maybe it’s for the best that it didn’t happen, but that would have been interesting. The King Kong vs human scenes are what you’d expect as they just get stomped the whole time. Preston puts up a fight of course, but once the gimmicks are gone, he doesn’t last all that long. The film had some nice cuts like the spider claw stabbing a poor guy and King Kong rising up above the Sun. Those were probably the highlight as far as the visuals are concerned. I would still take Godzilla 2014 over this though with the awesome energy blasts and the fight against Muto was a lot more fun. What King Kong needs is his own energy blast or an opponent who has one. Of course, then King Kong would probably lose if it’s the latter so maybe he can get his own special attack in the sequel. This film probably took its special effects a little to seriously in some scenes as you’d see the characters load their guns rapid style. A Scooby Doo film used the same trick a while back and I actually don’t care for it. The sounds are distracting if anything and the visuals weren’t cool to look at. Maybe do it for something with a little more pop like a cool lightning blast or something. King Kong doesn’t have much options for that though so the technique is just wasted here. None of the themes really stood out to me. It’s your standard action film stuff, but without the one stand out theme that is usually around. The end credits really pressed the point as they were eerily silent the whole time. The tune they picked for it really did not work. I’ll give the film some props for having the characters on the island the whole time. The film did start rather quickly and the action never stopped once they were on board. This was a double edged sword with all of the animal violence of course, but in theory it was a good move. I doubt the film would have been much better without the island anyway, maybe it could have scored a 6, but it would have been rather uneventful. You’d be taking the Skull Island out of Kong: Skull Island. New York City is a far superior backdrop, but I guess we can’t have every film take place there. Hopefully the crossover does though as that will really help with the visuals and intensity of the film. The writing for this film wasn’t terrible. There isn’t constant panic with expletives this time around although they do artificially force the worst word in once just to get the crowd going. With the review just about done, lets briefly talk about what could be cool to see in a sequel. To make the sequel better, we need to have King Kong come to NYC. That’s step 1. Next would be to give King Kong a cool robot suit or a transformation where he grows wings and does battle with a true Kaiju. Next, ensure that the main humans are all red shirts so they can all die in the crossfire without any humans getting too much hype. We don’t want another fire damages King Kong scene after all. Throw in a cool techno theme and we’ll have the makings of a great movie. Overall, Kong: Skull Island didn’t do it for me, but the odds of me liking the film were never great. You can’t take place on a retro island like this one that’s filled with animals and expect to be good. The odds of animal violence are simply too high and King Kong doesn’t have a great track record either. Also, it’s not like the film was subtle with the animal violence…a bird’s head was blown up…I’m not getting over that one. I don’t care much for apes and monkeys either so it would be very hard for me to really like Kong as a character. He did a good job of protecting his turf of course so I can respect that, but he’s still not all that “cool.” I’m excited for seeing where the cinematic universe goes from here though. We should be getting a lot of hype battles in the near future. Still, you don’t need to see this film to understand that though so I’d recommend checking out Pacific Rim or Godzilla (2014) instead. Both of those films do a better job of tackling the giant monster concept and have far better scenery and backdrops to grab your attention when the monsters aren’t around. This entry was posted in Live Action Movie Reviews, Live Action Movies, Reviews and tagged Film Review, Godzilla, Kaiju, King Kong, Kong: Skull Island, Movie Review, Review, Samuel L. Jackson, Thriller, Tom Hiddleston by dreager1. Bookmark the permalink. IMO this was a great film for me. At least we got a post credit scenes, several trailers, and well… over 20 TV Spots. Lol. True, there was a ton of marketing for this one. Definitely a harsh review, but the animal violence got me. I am hyped for the teaser at the end though. Things are gonna get hype! Well, I was definitely on team animal then! The fights were definitely pretty hype. The Skullcrawlers really made for imposing villains. It served as a nice warm up before King Kong goes on to fight Godzilla! Heh, I barely noticed until now that a comic series that served as both a prequel and sequel to this film is on it’s 3rd issue. It shows how Kong has evolved since the events of the film as it takes place in 1995. And he’s gotten bigger but no exact size measurement yet. I’m estimating he’s 200 ft in height. Yes, and here’s another picture. He’s gotten much bigger than he did in the movie IMO. Those flying creatures below are hard to tell. Now I noticed that Kong right now would have to triple his size and he’s an adolescent, which means he’s not very far from his adulthood. That would mean that Kong would need a massive growth spurt and I doubt he would just triple his size from natural growth as he’s an adolescent, which isn’t that far from adulthood. They would probably need some drug or explanation on how he tripled. I think Godzilla’s going to step on King Kong and think about finishing him off when Ghidorah and friends show up. Godzilla fights them which allows King Kong to escape and regroup. After that, King Kong decides to team up with Godzilla out of respect. 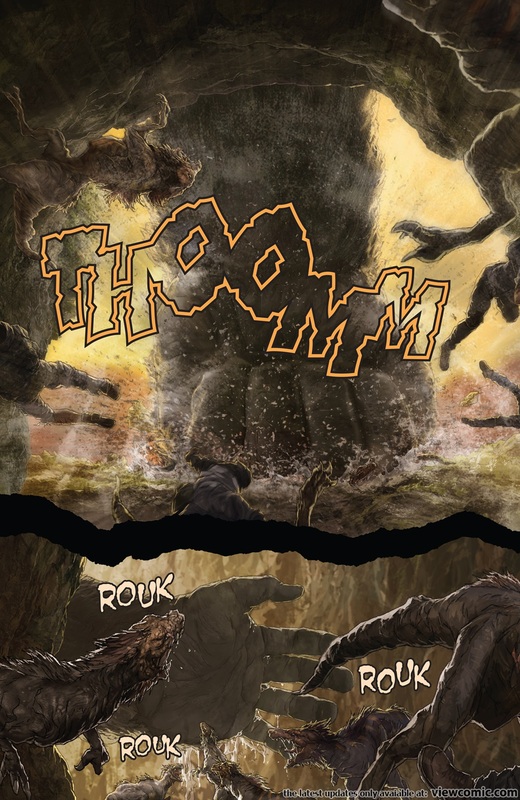 Yes, and Kong in the comic series has grown significantly over 20 years (the comic series takes place in 1995). Out of curiosity lol, what do you think is his height and weight? I’m guessing 200 ft as I said before and probably 30,000 tons. 130-150 ft? That’s still probably too small. He still would be smaller than the male MUTO and durability would barely increase. He needs to be at around 200 ft to pose a threat and 300 ft to pose a real challenge for Godzilla. It’s actually scans from the comic series.